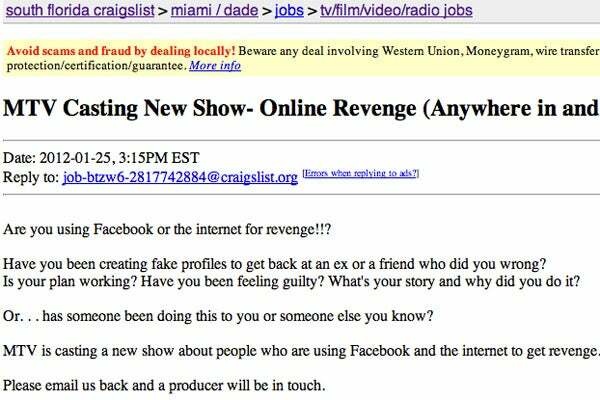 Is MTV Casting A Reality Show In Miami About Revenge? Um, What? Is MTV Making A Show About Revenge, Miami-Style? It's not like we obsessively scan Craigslist for news of the weird or possible ways to make money on the side, but if we did, we would have given pause to this strange posting directed towards residents of the 305. Apparently MTV is casting a show in the area about individuals who use the internet to get revenge: Creating fake profiles for stalking, profile trolling, reloading their Twitter page 40 times a minute to get live updates of where their prey in the internet crosshairs is going. And MTV has put out a casting call culling from the local, um "talent." Does this mean there's going to be a new True Life: I'm Stalking In The 331? We don't see any postings on MTV's casting call page, so we're wondering if anyone has tried out for this? Inquiring minds want to know!